We had some very nice weather for Memorial Day weekend in California, which is probably why we didn’t get anything posted on the blog. As the ever so powerful NBA marketing campaign has taught me, we need to get back to the top of our game. So I’m back at the computer to dish out some MLB power rankings. San Diego, Cincy, and Oakland are by far the biggest surprises in the MLB as they all hold their respective divisional leads, and nobody saw that coming. If you did, you’re a liar! It was quite an eventful weekend, and maybe if you were camping you might not have known that Roy Halladay threw a perfect game or that the Lakers and Celtics are squaring off in the NBA Finals for another classic, yippee… Anyways, here’s who I see as the top 16 teams in the league. They may have struggled a little lately. Being swept by Boston and going 4-6 over their last ten isn’t encouraging, but they have to be tested sooner or later to see if they are indeed for real. It’s a long season, and that three game lead they have in the division could disappear quickly with everyone in the AL East playing well. I think they need Pena to hit a little better than .177, and the rest of their lineup has been in a little bit of a lull. I’m sure they will start hitting again. I don’t see any Phillies like slumps coming on. The Yankees are starting to put up some runs and wins in bunches. They’ve only lost one series this whole season, and whenever you see them on your teams schedule, you are worried. I almost put them atop my rankings, but just couldn’t talk myself into it since they are three games back. The Yankees have a cakewalk in June, so don’t be surprised to see them atop the AL East by the end of the month. I dismissed the Twins in our predictions for the season, but when fantasy drafts came around I was all in on guys like Morneau, Mauer, and Span for all my leagues. Seems like they love their new digs. They are 19-9 in their brand new Target Field. Nick Blackburn just finished off an amazing month going 5-0 with a 2.49 era. Twins are finally liking that extension they gave him. I still can’t figure out why I didn’t see them as this good when the year started. It’s been a few weeks since we had our last power rankings up, and the landscape has changed a little now that we are about 1/5th of the way through the season. There were a few teams that fell out of the rankings, and some that moved up from the first power rankings we did. I’m really pumped that I haven’t had to put the Angels on the list. I think as long as Fuentes stays their closer that will help keep them off the list. Anyways, here’s how the top 16 shaking out. #1 Tampa Bay Rays (22-10) – Getting zero hits and zero runs in one game doesn’t lose you the top spot, especially when it was the first time they lost two straight on the road all season, and it took perfection to do it. The Rays worst starter ERA is Wade Price’s 3.18, and is the reason they are doing so well. We will see if they can hold up when they start playing in their division more. If the Yankees hadn’t mirrored their losses, I may have moved the Rays down a spot. #2 New York Yankees (21-10) – They’ve only lost one out of ten series they’ve played in this season. Maybe if Brett Gardner played a little better they might be number one, haha, just kidding. I’m pretty shocked how good Gardner is doing, and if he keeps it up I’ll be mad I didn’t pick him up for the fantasy team. Swisher has been great lately too, which makes me somewhat root for them, because I love my former A’s players. They’ve lost a couple in a row, but there are no concerns in NY now that Texiera seems to finally be seeing the ball. #3 Philadelphia Phillies (20-12) –After taking three of four from the Cards, and playing ten days in a row going 8-2 makes me think they must be the best team in the NL right now. Jason Werth wants that huge contract this winter hitting .329 with 26 RBI’s already! Their starting pitching is doing well as of late too only giving up 8 earned runs over their last six games. #4 Minnesota Twins (21-11) – No Mauer, no problem. Wilson Ramos seems like he belongs as someone’s backstop in the league. He might be able to take up a few extra games behind the plate sliding Mauer to the DH more often, so he can stay a little fresher. I don’t see why not with the way Ramos burst onto the scene last week (10 hits in his first three games). The Twins pitching has been better than I expected. They are +48 in run differential, and have allowed the sixth fewest runs, a good recipe for success. We now we have three solid weeks of baseball action in the books, and it looks like it’s time to look at how the top 16 teams stack up. MCeezy did a premature power rankings four games into the year, and it looks like that will likely be the last time the Giants and A’s lead the way. I’d love to see Battle of the Bay Part II, but unsurprisingly I don’t see anyway that would happen. #1 Tampa Bay Rays – Nobody should be surprised to see the Rays playing so well or at the top of the rankings. We knew they could score runs, but we didn’t know that they’d have Garza and Price dominating the way they have! The Rays are 9-1 on the road including a sweep of the ailing Red Sox. They are trying to make a push in what could be the final year they are all together. I hope they do, and that’s why I picked them to win it all! #2 Minnesota Twins – Who needs Joe Nathan!?! Is this the Bash Brothers Version 2.0? Losing him hasn’t hurt them on their way to one of their best starts in recent memory at 13-6. Rauch has been a huge pickup for fantasy teams, and has been great for the Twins closing out games. Justin Morneau looks like he’s finally healthy and back to his old MVP form. Mauer wants to continue off his stellar 2009 campaign, and has kept that MVP form thus far. Maybe Nike should look into getting these two guys some MVPuppet commercials. #4 St. Louis Cardinals – Speaking of Penny, going from the Sox to the Cards seems to have helped him regain his form (3-0, 0.95 ERA). They’ve have great offensive players that don’t need to be mentioned, and now a trio of solid pitchers. Even Piniero is pitching well. Dave Duncan know how to mold pitchers to their strengths! #5a Oakland Athletics – 12-8 doesn’t seem like that noteworthy of a start, but there is noway before the season started you could convince me that they would be atop the west for this much of April or any of it for that matter. Since 1992, they have only started 12-8 once, so there’s some reason for renewed but reserved optimism in Oakland. Their new style of play has them winning sooner than expected. Lots of injuries already though, and hopefully it’s not a sign that 2007-09 injury plagued seasons are going to continue. Gio has the highest ERA of 3.68 out of all their starters, which is amazing! This stat sums up the main reason they lead the league in starters ERA, and are close enough to win any given game. It’s no secret who my teams are. I’m pretty much a homer when it comes to sports. If you’re wondering who my team is in any given sport, just find the team located in Northern California and you’ve got it. Oakland A’s, Golden State Warriors, Oakland Raiders, Sacramento Kings, San Francisco 49ers, and if you have to find a hockey team, the San Jose Sharks. Every once in a while, though, there’s an out of market team that captures my attention. Often times it’s because of a player I like. Other times it’s because I’m a habitual underdog supporter, and there’s actually a team out there worse than mine. Here’s who they are, how they fared, why I liked them, and who I liked on the team…. Why I Liked Them: This team sort of tricked me. I had flirted with Bengals fandom for a few seasons, mainly on the strength of receivers, Carl Pickens and Darnay Scott. 2000, however, was the year I finally traveled down striped road and jump on the Bengal bandwagon, if there is such a thing. The problem was, Pickens and Scott were gone, and Akili Smith had assumed full time QB duties. 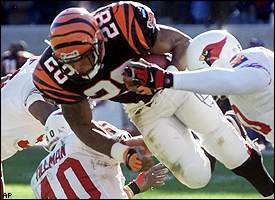 What was left was 1,400 rushing yards for Corey Dillon, and Peter Warrick leading the receiving core with an underwhelming 52 catches and 4 TDs. I almost bought a Peter Warrick jersey one day at the San Francisco City Center early that season. Good thing I didn’t, that’d be the second worst jersey in my closet right now. Do you know who I am? Do you know who I work for?? Unbelievable. What was Jorge Posada thinking when he elbowed his way past Jesse Carlson last night? Or was he? No one will ever accuse the Yankees of taking the high road, don’t get me wrong, but seriously, as a catcher you should be the first to understand the unwritten rules of the game. The Yankees hit TWO Toronto Blue Jays batters prior to the pitch that whizzed past Posada’s backside in the 8th innings. This is a common occurrence in baseball known as protecting your own interest, or better yet, just getting even. Posada chose to ignore the obvious and made it personal, evidenced by his immediate reaction to reportedly mouth the words “you don’t want to do that”. It was enough that the benches almost cleared right there, no harm no foul, let’s move on right??? Benches cleared as Gardner and Posada began to tussle, and Gardner was consumed by a pile of Yankees jerseys that had a much shorter distance to join the melee. MMA is just not for me coach! Not only did he set a terrible example for his own kids, Posada’s Yankee followers in the stands chose to make poor choices with dangers consequences. A an idiot Yankee supporter decided to throw a full soda bottle out onto the field and hit third base umpire and crew chief Darryl Cousins in the knee. He received a bruise bad enough to keep him from returning to the game, as a three man crew finished off the last inning and a half. X-Rays taken were negative. On a side note I hope they find this person and ban them for life, they are not true baseball fans just because they have tickets that close to the field. Upon further review, besides the obvious in regards to fighting, Jorge Posada’s Yankees are on track to runaway with the AL East and are heavy favorites to reach the World Series. Maybe Jorge just needs a hug! They have so much more to lose than the Blue Jays, who by mid-season were trying to unload their top 5 richest contracts as a concession to the season. What the Yankees don’t need is their star catcher injuring his hand in a fight, suspended for a week of important season ending games, and getting other players involved in his personal disputes. His teammates are not going to let him fight alone, and Jorge should know that by now unless he’s so insecure that he feels he needs to test them. For a 24 year old rookie maybe this mistake happens and you learn from it. But for a 38 year old veteran and World Series champ, I’m very very disappointed Jorge. Let me first admit I completely stole the idea of the RFP aka Random Forgotten Player of the Day. Some genius used to run THIS BLOG, but mysteriously stopped posting a little over a year ago. Not sure why he left off on Danny Tartabull, but I hope he’s okay. And if you’re reading this, Mr. Originator of the RFP of the Day, I’d really like to know why you stopped. Anyway, without further ado, I present to you Lloyd Moseby. It’s no coincidence that I chose Moseby. Chappy and I went to kindergarten with his daughter. One day he came to give our class a pep talk, and he was our favorite player for a good portion of the late 80s. He played 12 seasons from 1980-1991, 10 with Toronto and his final two with Detroit. He was an all-star in 1986, but his best season came in 1987, when he hit .282 with 26 HR and 96 RBI, along with 39 Stolen Bases. On the heels of Chappy’s MVP predictions, I figured there’s no reason not to start talking about the Cy Young races. Today, we’ll start with the American League, where I’ve narrowed it down to six guys. I had my list at seven, but after comparing the numbers, it was obvious that Edwin Jackson simply didn’t belong. There were others you could make a case for as well, such as Jarrod Washburn and Mark Buehrle, but ultimately, they wouldn’t have a chance to win it, so for that reason, we’ll leave them out. So, without further ado, I’m envisioning the award coming down to this group: CC Sabathia, Josh Beckett, Roy Halladay, Justin Verlander, Zack Greinke, and Felix Hernandez. Fortunately, the Cy Young Award seems to place less emphasis on the team’s win-loss record than, say, the MVP award. So, you could still argue that Halladay, Greinke, and King Felix are at a disadvantage, but I don’t think at this point it takes them out of the running. Rather than making a case for each guy, I’m going to cut right to the chase. I put these 6 guys side-by-side (by side by side by side by side) and one player stood out: Roy Halladay. See for yourself. If you asked me who I thought the frontrunner was, I would’ve said Josh Beckett or Justin Verlander. Given Sabathia’s well-documented success in the month of August, I’d have given him the inside track to make a late charge. I also would’ve thought that Zack Greinke’s dropoff since his outstanding start to the season would have taken him out of the running, but he still has very solid numbers. His 2.33 ERA is still the best in the league. So, if he were to regain his form, his final numbers might end up too good to ignore. For now, though, it’s Roy Halladay who deserves the honor. Part of me thinks he might get overlooked because he’s won the award in the past, but that was six years ago. His 13-5 record is pretty remarkable when you consider he’s playing for a team that’s 8 games under .500. It’s too bad he didn’t get the opportunity to pitch for a contender on a bigger stage down the stretch run of the season. Nonetheless, if he keeps up what he’s doing, it would be a disgrace to give it to anyone else. He’s easily the most consistent and dependable of the group. All five of the other pitchers have been prone to blowups. Halladay’s worst outing, numbers-wise, came two weeks ago against the Yankees, where he gave up 5 ER on 9 H in 7 innings pitched. If that’s the WORST start you have all year, you take it in a heartbeat. On top of that, Doc basically ranks in the top two in this group in each relevant category. His 2.65 ERA is second only to Greinke’s. His 173 IP is only short of Sabathia’s 178.2. His 13 wins is only one less than Beckett and Verlander’s 14. Most impressive, his WHIP (1.08) and walks (21) are far better than anyone else’s. The only knock on Halladay’s numbers are the number of hits he’s given up and the low strikeout total – however, he’s right on par with Beckett and Sabathia in that department. As for the hits, it should be noted that Halladay gave up a league-high 253 during his 2003 Cy Young campaign. The key for him is damage control. His strikeouts are limited because he excels at going deep into games. He has 45 career complete games, only 7 less than the other five guys combined. There’s no harm in giving up hits if they don’t score. I hope this all makes it as clear as it is to me. Like I said, I would’ve never put Halladay in the running before I dove into the numbers. Obviously, there’s plenty of baseball to be played, but for now, the Cy Young trophy should be in the Doctor’s waiting room. There are a lot of bad contracts for baseball players every year, but there are a few of them that must have had Ray Charles reading them over before they were inked in. In making this list, I decided to make a couple of parameters. The contract has to go through at least next season. The entire body of the contract has to be bad. For example, you really can’t argue against the $18 million Derek Jeter is due to make next year as being overpriced. If you look at how great the first seven years of his contract were for the Yankees, I’m sure there would be no hesitation in a do-over situation. You could say that someone like Eric Chavez would qualify as he’s due to make $11 million next season, and he has only played 418 games over the last 5 years of his 6 year contract. But on the flip side I can understand why they picked him to build a team around him at the time. He was never on the DL and won six straight gold gloves averaging nearly 25 HR’s and 100 RBI per season. So really when they signed him, it wasn’t quite as ridiculous as it looks. Here are a few of the ugliest contract situations in the MLB right now. It’s hard not to ignore the third Blue Jays since they have been under the Riccardi regime, they seem to like to cut contracts short. BJ Ryan, who is now out of baseball is owed $10 million next year. I guess they shouldn’t sign pitchers at the ripe age of 30 to five year deals coming off their first and really only good season of their career. They also dumped Frank Thomas last year and nobody wanted to pick up the tab on him either. They were scared of Alex Rios and his outrageous contract, but were lucky enough to get bailed out by the White Sox earlier this week. Come to think of it, just based on these three horrific contracts, how is JP still running things across the border!?! Must be some kind of Canadian loyalty or a forgive and forget kind of thing. Vernon Wells is about as ridiculous as it gets! He’s owed $23 million in 2011 and $21 million in 2012. He isn’t a good defender, and isn’t exactly tearing the cover off the ball. He has a no trade clause as if anyone would want to take on that money. Wait, maybe the White Sox will!?! Sorry Tony, but your Cubbies have a few monster contracts on the list. Soriano is tough to top as he’s due to turn 34 this off-season, and the Cubs owe him $18 million annually through 2014. He was a 40-40 guy when they signed him, but he was turning 31! It’s tough to justify giving him 8 years, and he may prove me wrong but since they signed him he’s been more of a 20-20 guy, and you can definately get that for cheaper. Milton Bradley is owed $9 million in 2010 and $12 million in 2011, for having half a good season in Texas before they signed him. Zambrano and Ramierez could be killers at the end of theirs, but we’ll see since they’re still doing well. It’s impossible to avoid Barry Zito’s contract in San Francisco. He’s going to get about $19 million for the next four years, and it’s the most widely criticized contract among the baseball world. If anything, you just hope the Giants learned their lesson after this one. They really didn’t though as they overpaid for Renteria this offseason, but not to the extent of Aaron Rowand’s deal that is in place. Rowand is going to make $12 million annually for the next three years. He did come off a great season, but since going to SF he hasn’t really showed that he was worth the money. I think he was on the over-rated side defensively to begin with. Yeah, he made some amazing catches, but overall he isn’t anything that special to warrant that much money. My favorite team to hate, the Angels, and Gary Matthews ugly contract will always makes me smile as long as it exists. He’s got two years left for nearly $12 million a year. He hitting a solid .250 in his Angels career and is holding down the fourth outfielder spot. Fuentes contract isn’t ridiculous, but personally I would have gone for something cheaper as he’s owed $10 million next year. At least his contract is a short one. Carlos Lee gets an honorable mention. He’s still a solid hitter, but how long can it last? He’s going to make $18.5 million annually for the next three years. He can’t run the bases or play in the outfield, so once he stops hitting it will look ridiculous. He looks to be on the road to being the next Travis Hafner, but at least the Indians only owe him $13 million annually over the next three years. As we wave goodbye to the steroid era (At least, I think) and the gross over spending on contracts for players on PED’s, I think lists like mine will shrink. If it doesn’t, we can blame it on GM’s like JP Riccardi! Alex Rios probably has made enough over his career to feel comfortable financially, but he received a bailout from the Chicago White Sox today. In one of the unprecedented moves I’ve ever seen, the Toronto Blue Jays put Alex Rios on waivers, just after he had signed a seven year $69.8 million dollar deal in April of 2008. Although JP Ricciardi said this was not a “salary dump”, there are only two explanations, they either knew more about his decline over the last two years or they really did need the money. It also may show that JP isn’t really a good GM as he failed to make a deal for Halladay when there were plenty of options out there for him, and now he’s dumping one of his biggest signings he’s made since being Toronto’s GM. Who knows whats going on north of the border! Maybe Rios couldn’t cut it when they started testing for certain PEDs that he was taking, which forced Toronto’s hand to cut ties before the monster portion of his contract kicked in. I’ve never heard a name as big as his just released for nothing. I saw it flash on television while I was at a Sacramento Rivercats game (Oakland A’s AAA team), and went back to my friends to tell them that Rios was on waivers and nobody believed me! That’s how weird this move was! The Chicago White Sox claimed him today, which has added to this perplexing situation. They picked up a fourth outfielder when they already have three good options in Dye, Podsednik, and Quentin. Just earlier this month they picked up Peavy via trade, and his ginormous contract of $45 million over the next three years, and now take on Alex’s ridiculous contract too! Why did they even want to pick up a fourth outfielder, especially one that is struggling? Maybe they saw how well it worked out for the Angels by overpaying on Gary Matthews Jr. to be their fourth or fifth outfielder. One thing I still can’t figure out is, why wouldn’t the White Sox just let him not get claimed? If they let him fall through waivers, which he probably would have with his terrible numbers this season (.264 BA, 14 HR, 62 RBI over 108 games). This is also his second straight declining season, which makes this even more baffling. If and when he cleared waivers, they could have signed him to a different contract over the off-season and easily could have paid him less than $10 million a year. They are three games out of the division race at the moment, and I don’t see how this will help them other than having a “good player” to fill in when other players have their rest days. If they made the move because they had Thome, Dye and Contreras coming off the books in 2010, then why not wait until the off-season to make this move to try not to upset the clubhouse hierarchy? If anything, this move will hurt them financially and chemistry wise, unless he has a Matt Holliday-like turnaround in his new surroundings. There’s one big difference, Rios doesn’t have Pujols or have the excuse of going back to a familiar league! Good luck with that one Chicity. #1 Los Angeles Dodgers – In the 2nd edition of the Doin Work Power Rankings, the Dodgers are still in the #1 spot. We’ll see if Schmidt can do anything for them. I almost dropped them to #2 after seeing the new look Cardinals win their second in a row against them, but you can’t argue with the best record in the league! #2 New York Yankees – The Yankees have won 23 of their past 29, and have seemed like the unstoppable machine that we had expected when they signed all those $100 million contracts this off season. They seem to be rolling full steam ahead and good luck to anyone playing them now. They are closing in on the Dodgers for the #1 spot. #3 Boston Red Sox – You can’t go against a team with good pitching and depth! They are in the toughest division, and are surviving the worst team wide hitting slump of the season. I’m guessing they will make a run at Cliff Lee to sure up those holes in their starting rotation that injuries left behind. #4 Los Angeles Angels – Yes, 2 Los Angeles teams in the top 4! And yes, I assure you there are plenty of fair weather fans roaming the streets of Southern California, I see them every day. The Angels seem to be catching fire winning 3 out of 4 from the Twins, and winning 12 of their last 15. They need to get someone so they don’t have to rely on Santana, because he looks like a black hole in the rotation. #5 Philadelphia Phillies – Looks like they keep getting denied on the Halladay offers. If that goes through they’ll be impossible to beat when he’s on the mound. They are averaging 5.49 runs per game second to only the Yankees. They look like they could wrap their division up by Labor Day if nobody gets hot. #6 Texas Rangers – The Rangers look for real this year, keeping the Angels in check. They’ve won 7 of their last 8. Their offense struggled after the All-Star Break, but it looks like they found their swings again putting up 12 runs in their last two games. #7 Tampa Bay Rays – It might be a good thing for them to be somewhat “under the radar”. Maybe not to the extent they were last year, but if they can figure out a way to get Kazmir and Price functioning properly they should make a push at the wild card spot. #8 Chicago Cubs – They are on fire winning their last 5 games and 12 of their last 14. Although it’s been weak competition, they still have overtaken the Cardinals for the top spot in the division. We’ll see if this winning lasts when the competition gets better. #9 Detroit Tigers – The Tigers have a plethora of pitching and a ballpark that caters to pitchers, which probably explains their 31-16 home record. Rick Porcello has been a nice surprise, but it’s been Fernando Rodney’s 21 saves in 21 opportunities that has stabilized the 9th inning all year. #10 St. Louis Cardinals – With Holliday and Derosa in the lineup, they looked really good against the top ranked Dodgers. You could even say they have a lineup that’s scary! I think they look poised to battle with the Cubs in the NL Central. #11 Colorado Rockies – The Rockies have gone 34-13 since June 4th which has them in the lead for the NL Wild Card at the moment. Surprisingly, their pitching has been the part of the team that has shined over that stretch. We’ll see if that keeps up in the thin air. #12 San Francisco Giants – If the Giants make a trade for a hitter, they could make the jump into playoff contender. As it stands they may win the Wild Card, but I don’t see them making it very far if they do make it. Their pitching can only get them so far. #13 Chicago White Sox – Their bright spot was Buehrle’s perfection. Their bad spot, is the middle of their order where they are getting no production in the home run department from Dye, Thome, or Konerko. If they are going to go anywhere, they need these guys to start hitting. #14 Atlanta Braves – They’ve been playing well, but they aren’t going to even get a whiff of the Phillies in the division race. Say what you want about Ryan Church for Jeff Francoeur, but it seems like there’s a change in the clubhouse attitude. Their starting pitchers have a combined 3 loses in the month of July. #15 Seattle Mariners – King Felix finally looked human tonight giving up more than one earned run for the first time in his last 13 starts! Seattle seems to be fading behind the Rangers and Angels, but look much improved over the past few teams they put out there. #16 Florida Marlins – Han Ram is hitting a eye-popping .427 with runners in scoring position. He is also the league leader in BA. They are so up and down, I’m not sure what to make of them. I think they’ll finish out the season around the .500 mark. #17 Houston Astros – Nobody could figure out how they were doing as well as they were, but it looks like they are falling back to earth as the wins aren’t coming as easily as they were. A rough series against the Cubs pushed them backwards in their quest for a division title. #18 Milwakee Brewers – The Brewers, just like the Astros have hit a rough patch going 3-7 in their last 10 games. If they don’t make a move at the trade deadline, Prince and company may have to slug their way into the playoffs. I don’t like the odds of that happening. #19 Minnesota Twins – Minnesota looked bad on their westcoast swing losing games to the A’s and the Angels in every way possible. They should have a shot at the division if they can straighten out that rotation, and stop letting other teams put up those crooked numbers on a nightly basis. Their offense has been good, but that means nothing when you can’t stop the other team. #20 New York Mets – They haven’t looked like a playoff team, and the injuries have piled up over the season. It may have been too much to overcome. Since no New York team is ever a seller, look for them to try to make a move that will give their fans at least a little hope. #21 Toronto Blue Jays – We’ve all been wondering where Halladay will go or if he’ll even go. It’s starting to remind me of the Favre saga. The Blue Jays have had a nice run lately with all their players trying to showcase their skills in hopes of being traded out of the Canadian black hole to a contender. #22 Cincinnati Reds – At least they stopped their losing streak against San Diego. They haven’t shown signs of anything good or consistent. The emergence of Brandon Phillips bat has helped fantasy teams out though. They seem to be stuck in the same situation year after year, and yup, it’s a bad one. #23 Oakland Athletics – Possibly too high for a bottom dweller, but their pitching continues to mold towards next year as some of the rookie starters have shown promise. The question now is, when will they throw Brett Wallace into the mix!?! #25 Cleveland Indians – Cliff Lee has regained his Cy Young form after a rocky start. It seems like everyone on their team is on the trading block. We’ll see if any deals get done, as they have some players that could be very valuable to a contender. #26 Arizona Diamondbacks – Mark Reynolds and Dan Haren have been the only two bright spots to their season so far. Maybe they gave up too much a couple years ago to get Haren, so they have no options behind him. Maybe the fans have something to look forward to other than every Haren start, but I’m not sure what that is. #27 Baltimore Orioles – The Orioles are letting the young guys take over, and the young guys aren’t winning. They need to move some guys like Mora to shake it up and get some pitching. #28 Kansas City Royals – The Royals are good at one thing, and they keep doing it well. Being in last place is a staple for this team, and they are making a push to stay there losing 80% of the time over their last two weeks. #29 San Diego Padres – They have Adrian Gonzalez, so at least it’s worth it to go to the park to watch him bat a few times. He has played in 308 consecutive games, which is a club record and the longest current streak in the MLB. #30 Washington Nationals – Willingham got them in the news with his 2 grand slams. They might even be able to trade him for something now! The Trade Deadline is Coming Who Will Find a New Home? With the trade deadline approaching, it looks as though teams need to make some moves to ensure that a playoff run is going to happen. There are powerhouses (Dodgers, Phillies, Yankees, and Red Sox), that may not need to make a move to make the playoffs, but there’s a good chance they may need to make a move to win a championship. I’ve been waiting to see what prospects the A’s can pull out of it, and they do have a few bargaining chips so this may be the last time I’m excited about news from them for awhile. Aside from the Halladay sweepstakes, many say there aren’t many difference makers in the market this year. I agree to some extent that Halladay could make an impact like CC Sabathia did last year taking Milwakee to the playoffs. Then again there are the subtle differences like Boston adding Orlando Cabrera and upgrading their defense to help them push their way to breaking the curse. I will run through some other players not named Halladay, that could be a big difference maker when it’s all said and done. Matt Holliday. I guess I have to start with a player from my team. I’m just hoping we get something to the tune of a few major league ready minor league players, instead of two compensation draft picks when he leaves this off-season. San Francisco, Atlanta, Chicago, and even Boston could use some power at the moment, and are all within three games of the wild card spot at the moment. Holliday hasn’t lit the world on fire since coming to Oakland, but is showing teams he’s still a good player as it gets closer to the deadline with 3 HR’s, 13 Runs, 14 RBI, and a .311 BA over the last month. Justin Duchscherer. Another A’s player, and Buster Only was all over him as a poor man’s Halladay. I’m not sure I’m sold on him returning to his dominant form of last season, but the numbers don’t lie, as he’s set to make his re-hab stint and hopefully a return to the majors soon. Pitching as a reliever or a starter his ERA has never been higher than 3.27, which makes me a believer that teams would pick up his modest salary in hopes he returns to form by playoff time. It also opens the door for him to return to the bullpen when he makes it back up, which would make the likes of Wuertz and Ziegler available. I would rather have either of them that the Orioles George Sherill. Victor Martinez. He’s having a solid comeback season with 14 HR’s, 59 RBI’s and a .286 BA. Vic is a player that would be a good fit for Red Sox or the Mets with Delgado and Lowell constantly battling injuries. He would also be a solid fit behind the plate in Boston with the deteriorating Varitek. Cliff Lee. I think the chances of Lee making as much of an impact as Halladay are fairly likely. It’s been reported that since the Sox placed Wakefield on the DL they sent their top scout to Toronto to watch Lee dominate the Jays in his second consecutive complete game. It seems like Cleveland should have plenty of phone calls for last years Cy Young award winner and Martinez. Marco Scutaro. He’s an interesting player on the block. I think he is the ultimate team player, kind of like Mark DeRosa was to the Cubs last season. He can play multiple positions, and can come through with clutch hits (Many fond memories of him in an A’s uniform). He’s a glue guy that every contender needs, and if a team deals for him they won’t be disappointed with what he brings to the table. Freddy Sanchez. The Pirates failed to reach agreements with Sanchez and Jack Wilson, so it looks like once again they will be trying to trade their soon to be free agents for some more prospects. Sanchez is the most interesting of the two as he plays phenomenal defense, and gets on base with regularity hitting .311 on the season. He’d be a good fit with the Giants or the Cubs. Only time will tell, and after July 31st we will see which teams make their upgrades, and which teams think they already have what they need. Even though I doubted there would be any fireworks this year. I think there are some good names on the market besides Halladay! Is Teabagging Going Too Far?! ?